An ambitious strategy involving improvements to infrastructure and new buildings. This masterplan aims to establish strategic infrastructure on an isolated site through initiatives such as a new tram interchange, pedestrian bridge and the pedestrianisation of existing roads. 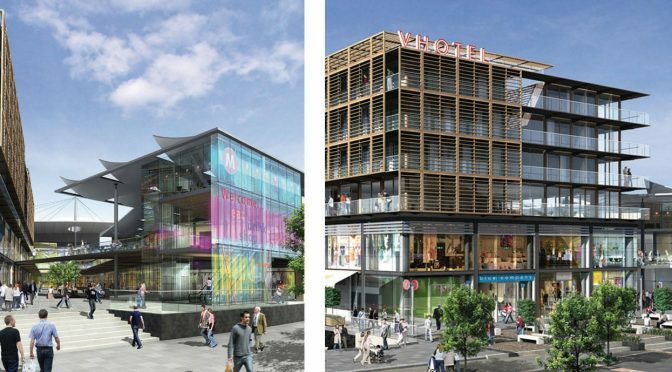 Key destinations, including an ice-rink, boutique hotel, bars and restaurants, department stores and a new high street, have been used to generate new pedestrian routes through the site. Combining commercial uses and contemporary apartments within mixed-use buildings creates a continuous presence on site, which is seen to be a significant factor in the creation of a vibrant community with long-term viability. The masterplan envisages the use of a shared palette of materials, including timber, glass, steel and rainscreen cladding, to present a coherent network of buildings.